Wait 5 minutes or less! 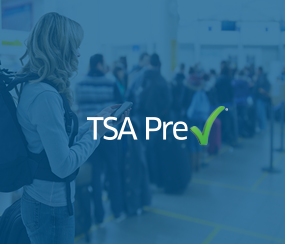 The TSA Pre✓® Enrollment Voucher entitles you to a one-time unique authorization code to use in lieu of payment for the application fee ($85 value) for your five-year TSA Pre✓® benefit. If approved by the TSA, you will enjoy an expedited security-screening experience that takes the stress out of travel with no need to remove shoes, laptops, liquids, belts or light jackets.